STEMscopes from Accelerate Learning offers an online, comprehensive, hands-on pre-K–12 STEM curriculum for schools. The STEMscopes platform features extensive content, teacher support materials, hands-on activities, lesson planning tools, professional development, and more. Quality and Effectiveness: The “scopes” in STEMscopes are lessons, and the various topics are aligned with the Common Core State Standards and Next Generation Science Standards (CCSS and NGSS). They’re organized by grade level or topic, and there’s a handy search function for exploration. The detailed lesson plans include directions for implementation. They can be customized for long- and short-term units of instruction, so teachers can go as far and deep as they like. Ease of Use: When users select a scope, they’re taken to a page with a lesson overview. From there, users can easily access a huge number of customizable resources for that lesson. STEMscopes breaks down lessons using the 5E+I/A framework (engage, explore, explain, elaborate, evaluate, intervention, acceleration). There are links to resources and classroom activities for each part of the framework. Creating a lesson plan is as easy as dragging and dropping, and lesson “Essentials” make sure teachers don’t miss anything. Essentials tell users what specific standards the lesson covers and include a graphic organizer and background materials. 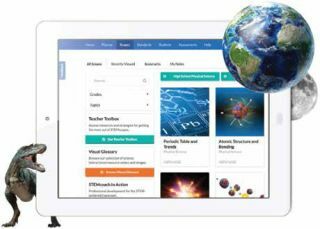 Creative Use of Technology: A comprehensive resource for both teachers and students, STEMscopes is a multimedia environment where both students and teachers can learn more about lesson and activity content. In addition, a link at the top of the page labeled STEM Coach takes teachers to an area with PD resources and videos to help them successfully implement their scopes. This is a great asset that’s not always included with other platforms. Suitability for Use in a School Environment: STEMscopes is a great for all pre-K–12 schools. It’s flexible, aligned with curricular standards, and provides educators with the tools they need to build engaging lessons. Each scope is designed using a cross-curricular, constructivist, hands-on approach that drives student inquiry. The design teaches the ability to differentiate—whether it be with a simulation, Lexile-matched reading, or a hands-on lab. STEMscopes is a comprehensive pre-K–12 STEM curriculum based on solid research that was designed for teachers, by teachers. STEMscopes is a great solution for schools that want an online learning platform that can replace textbooks. The content is regularly updated to ensure that everything is current, hands-on, engaging, and authentic. • Inquiry-based, cross-curricular content that’s aligned to NGSS and CCSS. • Full set of support features for teachers to build custom lessons, complete with PD for successful implementation. • Comprehensive, regularly updated, and accessible, STEMscopes can be used as a textbook replacement.